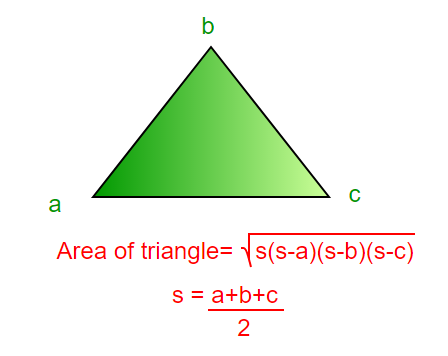 Area of a triangle can simply be evaluated using following formula. // must be smaller than third side. # must be smaller than third side. // This code is contributed Nitin Mittal. // be smaller than third side. // This code is contributed anuJ_67. If we are given coordinates of three corners, we can apply below Shoelace formula for area. // (X[i], Y[i]) are coordinates of i'th point. # (X[i], Y[i]) are coordinates of i'th point.